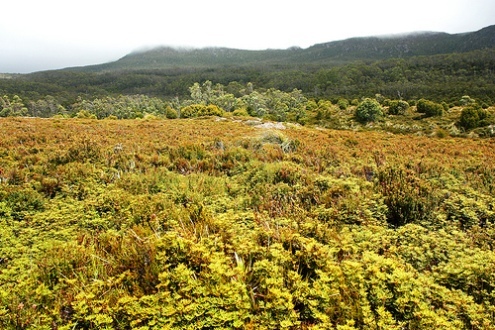 Hartz Mountains National Park is in Tasmania. 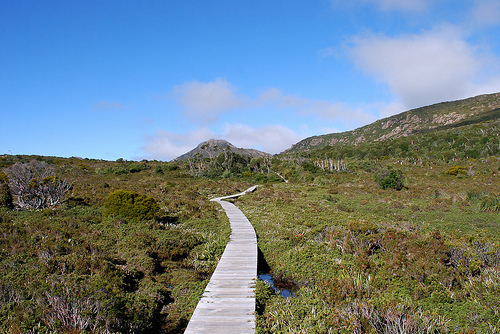 Only 86km south-west of Hobart, Hartz Mountains is a beautiful national park with a variety of vegetation, glacial lakes and waterfalls, and views over mountain ranges and the southern coast of Tasmania. Here is some information about the park, and in the end of the page is an interactive map. 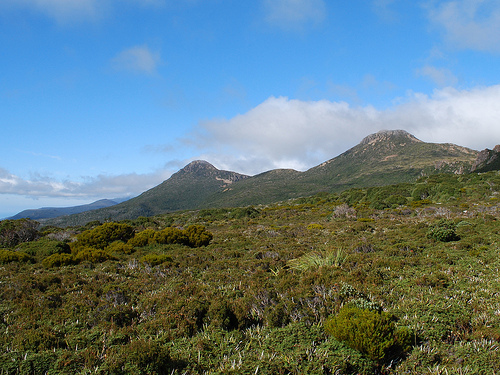 The lower altitudes of Hartz Mountains consist of sedimentary rocks, while the higher altitudes consist of dolerite – a rock typical to Tasmania but absent from mainland Australia. Many animals of the area are nocturnal, but the ones you can see during the day time include echidnas, platypus, possums, Bennetts wallabies and Tasmanian pademelons. Birds include ravens, honeyeaters and some species of parrots such as green rosellas. There are also many species of frogs, and in 1992 a new species was discovered in Hartz Mountains. There is a variety of vegetation, and as often in Alpine areas, vegetation changes with altitude. 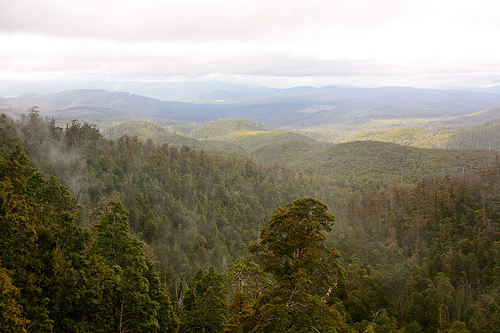 The lower areas support wet eucalypt forests dominated by stringybark, while higher up there are open forests of snow gum and other smaller Eucalypts. Highest up, above the tree line there are heathlands. 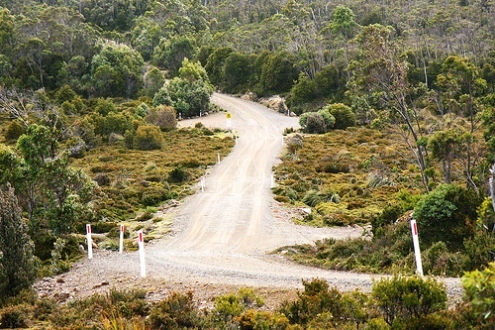 You can camp in the Hartz Mountains, however there are no camping facilities. Near the entrance to the Waratah Lookout Track there is a picnic ground with a shelter, fireplace, gas barbeques and tables. The weather in Tasmania can be unpredictable and Hartz Mountains are known for extreme weather conditions, so make sure you bring warm clothes, register at the Walkers Registration, and let someone know where you are going and when you are planning to get back. The shorter bushwalks include Waratah Lookout (5min return), Arve Falls (20 minute return), and Lake Osborne (40 minutes return). The Waratah Lookout walk is an easy stroll along a gravel track that goes to the lookout point with views over Huon Valley. Arve Falls Track starts from a car park past the picnic shelter, and goes through some lovely Alpine vegetation like herbfields and snow gum woodlands to the Arve Falls. Lake Osborne walk climbs gently up to Hartz Plateau through some young rainforest and woodland to this beautiful glacial lake. Both Arve Falls and Lake Osborne walks have informative signs about the vegetation and geology of the area. Here's a map Hartz Mountains National Park where I have tagged the places that I mentioned on this web page. You can click on the tags to see what places they are, and double-click anywhere on the map to zoom it in and see the places closer. Drag the map to move around, and if you want to see the satellite image with Google Earth, click on "Sat" in the top right hand corner. Been to Hartz Mountains National Park?